The Hong Kong container terminals are renowned for their efficiency. In year 2017, Kwai Tsing Port handled over 16.2 million TEUs, roughly about 80% of the total container throughput of Hong Kong. Altogether, there are 24 container berths with a total quay length of 7,694 meters in Kwai Tsing Port, providing currently an estimated capacity of 21 million TEUs per annum. With additional land support, Kwai Tsing Port will be able to increase its handling capacity to at least 24 million TEUs per annum. Equipped with the latest quay cranes capable of handling 24-across container vessels and an alongside water draught of 14-16.5 meters, the Hong Kong container terminals are ready to handle the latest generation of container ships. 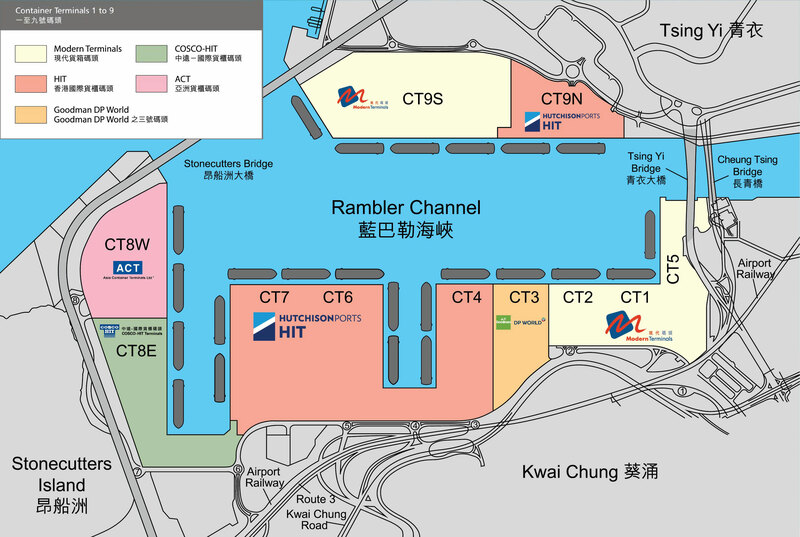 At present, construction works are being carried out by the Hong Kong SAR Government to deepen the Rambler Channel and its approaching channel to 17 meters. All terminals of Kwai Tsing Port continue to achieve high productivity and efficiency through innovation, customer focus and value-added services.